But unlike other women whose educational credentials could make other men squirm in embarrassment and insecurity, the new Batangas governor has no college degree to speak of. And what makes her victory even more special is the fact that Santos-Recto, a female, won in a province known as “barako country” – where men are expected to dominate. Two, she is an actress. And like it or not, other showbiz denizens who have thrown their hat into the political arena did not exactly give stellar performances as public servants. In fact, majority of showbiz celebrities who ran for office last May were clobbered at the polls, with some people even snickering at the news of these actors’ defeat. But not Vilma Santos-Recto. But then again, Santos-Recto, or “Gov. Vi” to her constituents, did not exactly get to the position of governor empty-handed. 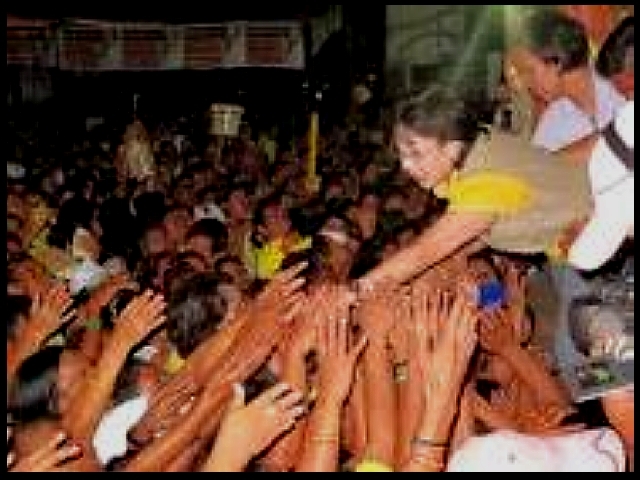 On the contrary, she had already set a record of sorts when she became the first female mayor of Lipa City in 1998. “I must admit that initially, my being an actress was a plus factor, and it was a definite edge when I first ran for mayor of Lipa,” she admits. “But during my first term, some people also underestimated me especially since I was not from Lipa (she is from Pampanga and Nueva Ecija), I was from show business and I was a small woman. Of course it’s different if you have the height,” she laughs, recalling those days when the men would merely give a slight nod of acknowledgement, at times grudgingly, in response to her greetings. But the multi-awarded actress soon proved that she was not just acting out a role as local chief executive; rather, she meant business, and she was in it for real. During her watch, the economy of Lipa City boomed, with infrastructure improvements that put the city on the radar of big time developers and investors that steadily increased government revenues year after year. “I eventually earned their respect because they discovered that lalaki akong kausap (I am also a man to talk to) and second, I am straight. If there’s an immediate solution at hand, then let’s not wait for tomorrow or next week to do it. People are tired of waiting and of lip service, so let’s get them what they need if we already can. But if there’s nothing I can do about something at this time, then I tell the people so they will not also keep on hoping,” she discloses. “If there’s one thing that people appreciated from my administration, it’s the fact that I did not politicize my position. Even the barangay captains who did not support my candidacy were not deprived of the services their constituencies needed. Whether these leaders were political allies or not does not matter – I will give them what they need because it is the people who will benefit. “Perhaps it’s because I am a woman and a mother. A mother’s heart is different; a woman’s pulse is different,” she adds. Which is probably the reason why one of her priorities is to uplift the quality of education in her province. She recalls a time when, during her tenure as mayor, she was “frustrated when grade school students took this exam and 70 percent did not pass. You know what I did? I gave a big allocation to have the day-care centers upgraded to Montessori level. We cooperated with the school of Mrs. (Precious) Soliven of OB Montessori and had the day-care teachers trained by them. Even the educational materials, we upgraded. The neophyte politician could not understand why she would become a target. “I was not doing anything wrong, I was just serving the people. I wasn’t part of a syndicate. So Ralph made me go on a two-week leave and I prayed and prayed. Of course I was afraid, I have children, I am a mother, and I felt that it was not even worth it to sacrifice my family. But then I also realized that the people who voted for me – I also won by a landslide – gave me their trust. They believed in me and were counting on me, so it would not be right to disappoint them, so I went back to work albeit with enhanced security,” says the governor, who admits that yes, she knows how to use a gun and in fact practices at the shooting range in her Lipa home. Asked if she misses making movies, the 53-year-old actress gives a big smile. “I miss acting, I miss my showbiz career. In fact, I already have an offer, but I will have to ask the people of Batangas first like what I used to do in Lipa. Lipeños used to ask me ‘Mayor, why aren’t you making any more movies? We miss seeing you act!’ And I would tell them, ‘You want me to make movies and then you will hit me with rumors that I wasn’t going to work?’ But then during flag ceremonies I would ask them, “Please allow me to make a movie, that’s my racket. I earn a lot there. If you don’t, then I’d steal from you’!” she says in jest. For someone who started working at the age of nine and has been a virtual public property since her teenage years, the life of Vilma Santos-Recto is an open book. She is a “survivor for all seasons,” as STAR entertainment editor Ricky Lo called her. She was at the height of her career in the ’80s when she found herself bankrupt and facing a possible lawsuit from the Bureau of Internal Revenue, her properties mortgaged. “I was so trusting. I would just sign checks and anything they put before me. So there I was, pregnant with Lucky and I owed Php9 million without knowing why!” Edu, who was then a budding actor, was very supportive and wanted to help her get out of her predicament. It took her four years to pay off her obligations (“When I saw the last billing statement of P50,000, you could not imagine the joy and relief I felt!”) – but it cost her her marriage to Edu Manzano. But the sad experience taught the actress to be smart with her finances. “Ngayon wala akong utang (I don’t have any debts to this day),” she proudly declares. And it naturally helped that she has her beloved Ralph by her side. While it pains her that her husband lost in his re-election bid as senator, she takes it as a blessing in disguise. “Perhaps the purpose was for him to help me, since this is already the whole of Batangas we are talking about. Hindi na biro ito (This is no joke). They say politics and showbiz are the same, but no way, malayo. Show business is more manageable even with all the intrigues. Politics is more tough. If you are not strong, you would buckle under the pressure. The attacks here are more personal, and the system is really different,” she reflects. This entry was posted in ARTICLES and tagged ARTICLES, Philippine Star, Vilma Santos-Recto: Breaking the Mold. Bookmark the permalink.